In a medium bowl, whisk together the marmalade and Riesling. Add the salt, allspice and cloves. Marinate the pork chops in this for at least four hours or overnight. Heat the oil in a large skillet over medium-high heat. Lift the pork chops from the marinade and sear in the hot oil until they are brown, about 2-3 minutes on each side. Take care that they do not burn. Pour in half of the marinade and bring to a boil. Reduce the heat to low and simmer, covered until the pork chops are cooked through, about 6 minutes more, turning often to prevent scorching. Remove the pork chops to a platter and keep warm. Reduce the sauce to a sticky glaze. 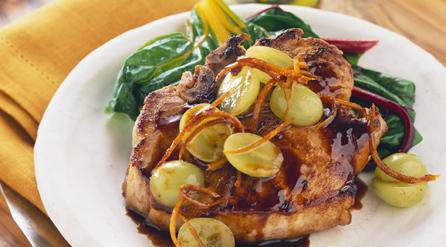 Add the grapes and orange zest, stir well and then spoon over the pork chops. Serve immediately.